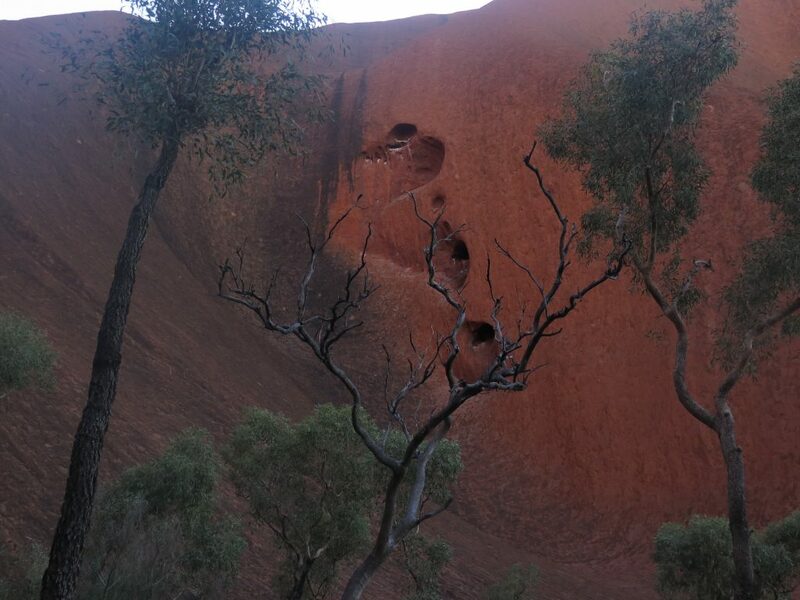 Uluru (sometimes called Ayers Rock) – is one of the largest monoliths in the world. Made of arkosic sandstone, Uluru rises 348 metres above the desert floor and has a circumference of 9.4 kilometres. Walking around the base of Uluru, you will see expansive rock faces of arkosic sandstone rise up to 348 metres above the red desert sand. Uluru standing 348m high, is higher than The Eiffel Tower and 2.5 times the height of Sydney Harbour Bridge. 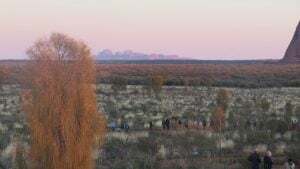 We were up early for a 6am start to watch the sun rise over Uluru, and Kata Tjuta in the distance. It was a very cold morning, necessary to dress in layers as the day will warm up. Scarves and gloves were the order of the day, and hot tea or coffee and biscuits were provided while we waited for the sun to rise. It was very crowded, lots of coaches lined up, plus cars, caravans and motorhomes. 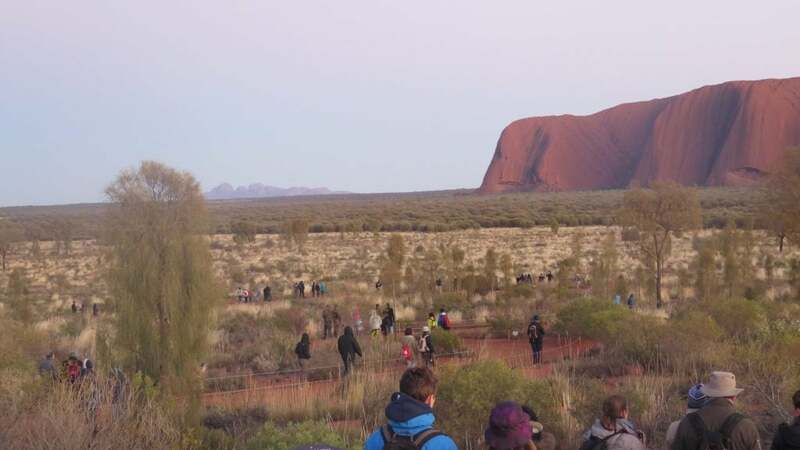 This event happens every morning, 365 days of the year, when people flock to Uluru to watch the sunrise (below right). 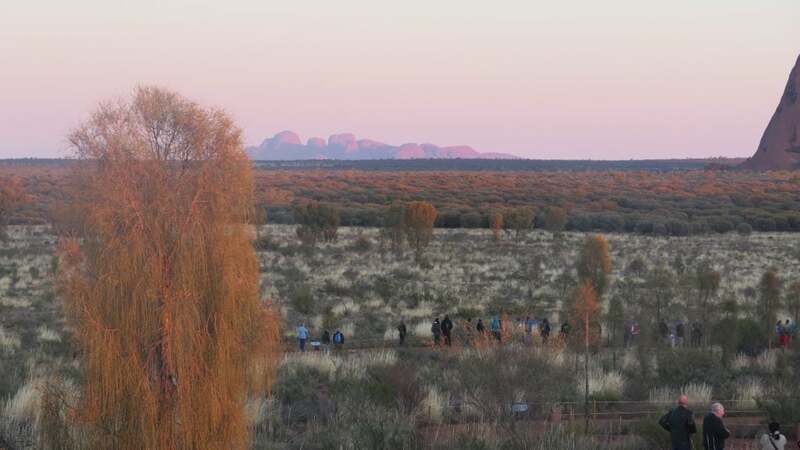 It certainly is a wonderful sight, and very special to also see Kata Tjuta with the first rays of the sun lighting up the tops of the domes (below left). Returning to our coach we set off for a drive around the base of Uluru. 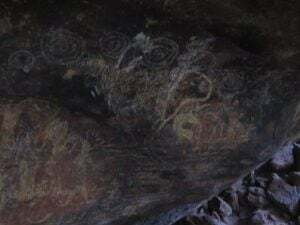 There are certain parts where you are asked not to take photographs, again because it is a sacred site to the local Aboriginal people. 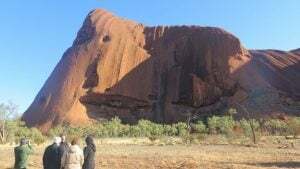 We were on the shady site of Uluru, so it remained quite chilly while we were guided along the Mutitjulu Walk and the beautiful Mutitjulu Waterhole. 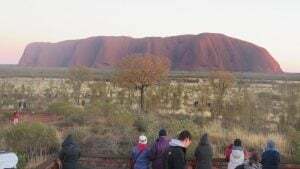 Our guide, Bec, escorted us to see some rock paintings inside a cave, and told us about the Aboriginal and European history of Uluru, pointed out some native flora, and explained the Aboriginal and European history of Uluru. She pointed out marks in the side of the rock and told us Aboriginal stories explaining their meanings. 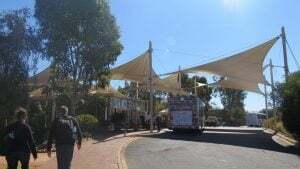 We spent quite a lot of time walking around the base of the rock but everyone was shivering by this time, so we boarded the coach again, and taken to the Uluru Kata Tjuta Cultural Centre which had some great exhibits of Aboriginal culture and arts and crafts, but no photographs were allowed inside or outside the centre. Our coach then delivered us back to our hotel, Sails in the Desert. 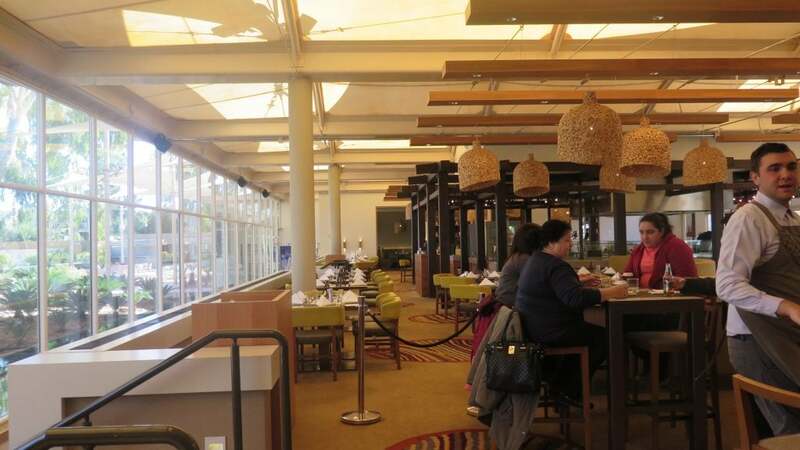 We had time for a bite to eat and a last walk around the hotel before we were again collected by the coach for our trip to Kings Canyon where we will stay the night. 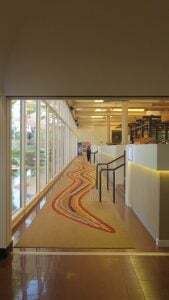 The hotel has recently been tastefully renovated, and has the most beautiful river gums as a feature. 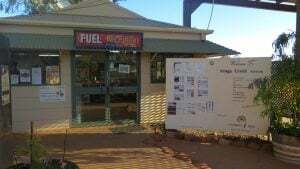 From Alice Springs (or Yulara) we travelled via the Stuart Highway, Lasseter Highway and Luritja Road on our way to Kings Canyon, stopping at Kings Creek Station (images below) in Watarrka National Park for a break. 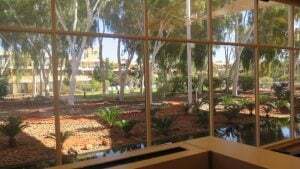 The Park is located about 450km southwest of Alice Springs, so we have been travelling long distances in this vast territory. 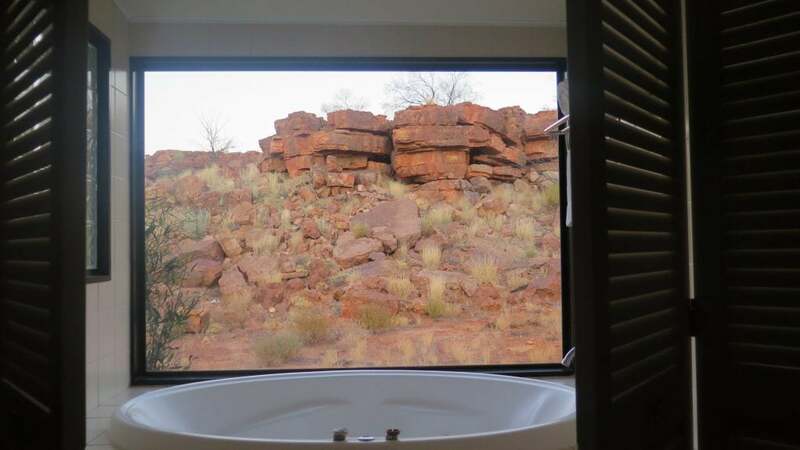 Watarrka National Park encloses Kings Canyon, with its 300-metre-high sandstone walls, walking trails, lush forests and permanent waterholes. The sheer red rock face of the canyon soars above dense forests of palms, ferns and cycads, sheltering them from the harsh desert, and providing refuge for many native animals. The Park has been home to the Luritja people for more than 20,000 years, and its flora, fauna and rock formations are best seen on foot. Located at the western end of the George Gill Range, Watarrka National Park is a landscape of rugged ranges, isolated rock holes and gorges. Ancient rock formations, shaped by the forces of wind and water over thousands of years, rise from the plateau. Our guide, Carl (as with all the other guides we have had on our tours) was very knowledgeable about the areas we have travelled through. 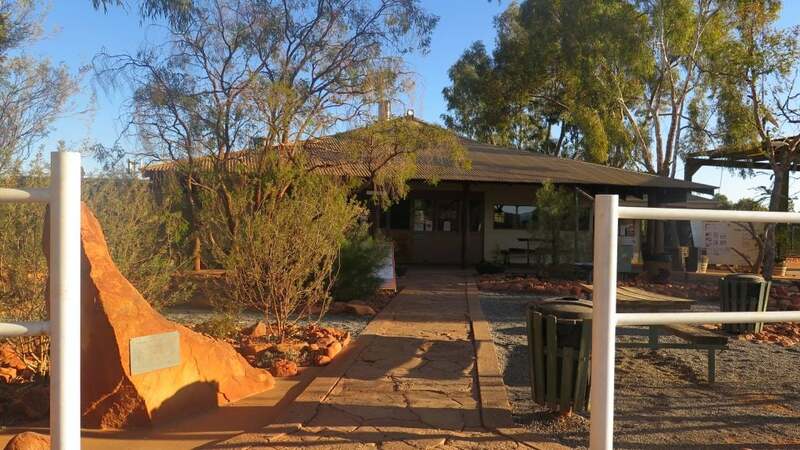 He told us that although Watarrka National Park is a long distance from the conveniences that we enjoy every day, there is a reasonable population in the Park. 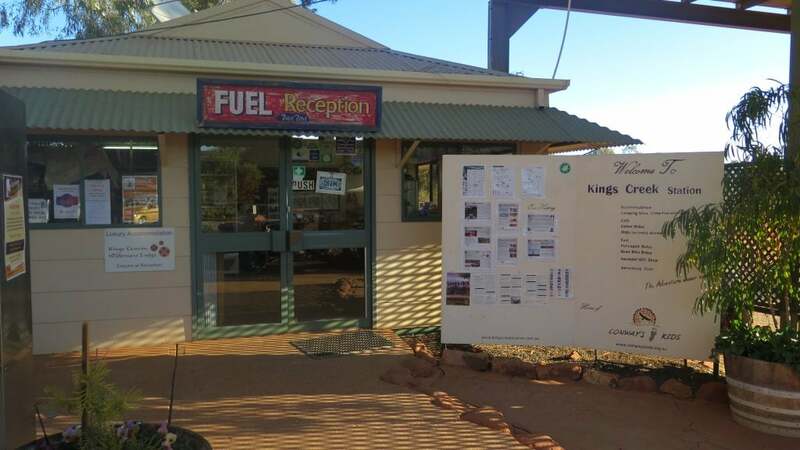 For instance, there are six park Rangers and their families, the staff at Kings Creek Station and the Aboriginal communities scattered throughout the Park. 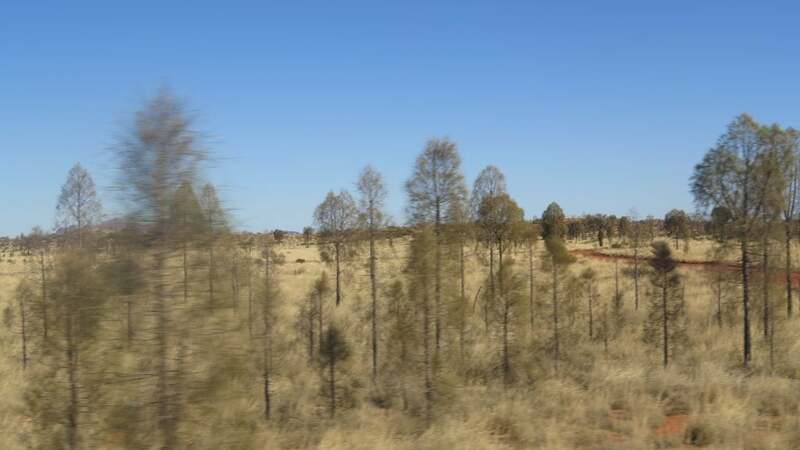 This Park is not yet heritage listed, so has Northern Territory and not Federal funding. 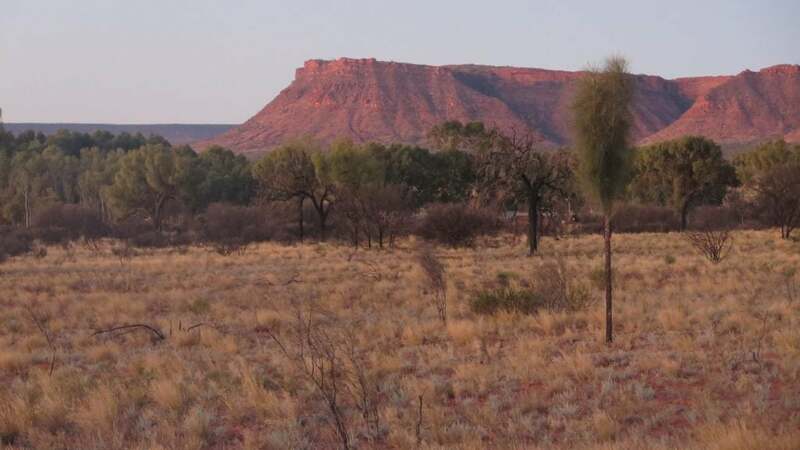 It is the home to many endangered species in the Park, the Bilby and Mala (Rufus hair wallaby) are now extinct here, and it is a huge area for six Rangers to manage. What is significant about this area is the large diversity of plant species that survive on the salt flats, sand dunes, gorges, canyons and screes, and one notices the changes in vegetation as we travel. We drove through a Desert Oak forest, these are unusual trees with weeping needle-shaped foliage, they belong to the Casuarina family (image right), and there are lots of juveniles that stand like thin sentinels, waiting to tap through to the water below so they can grow to mature trees. 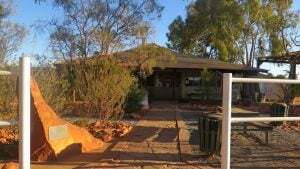 By this time we were driving through the Angus Downs property of 3500 square kilometres, originally a cattle station that was purchased by Bill Little, an English stonemason. He built many stone houses and station buildings and requested that he be paid in cattle in lieu of cash, so he was able to stock the station. There are no cattle there now. The Giles Track was close to the road we travelled, this Track is a 22-kilometre walking track located within Watarrka National Park. 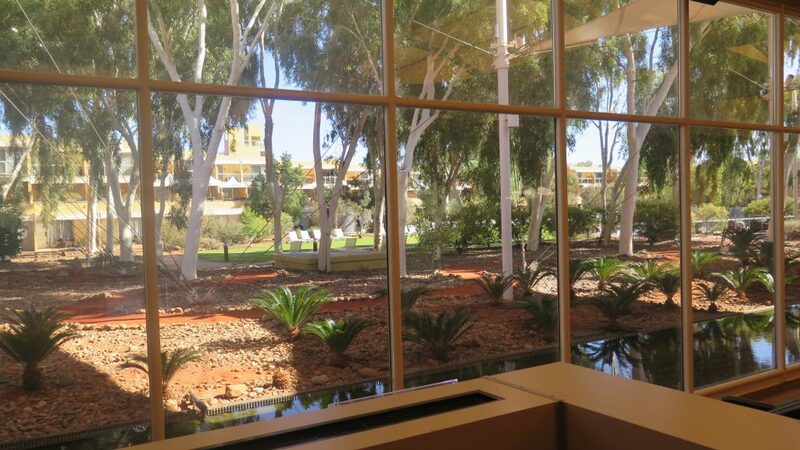 The two-day hike offers the chance to experience impressive natural landscape and wildlife, indigenous history and culture, and the heritage of Central Australia. 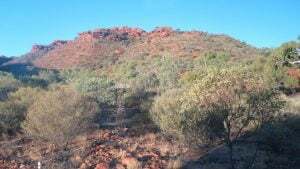 The Giles Track is named after the first European to explore the George Gill Range in 1872, Ernest Giles. 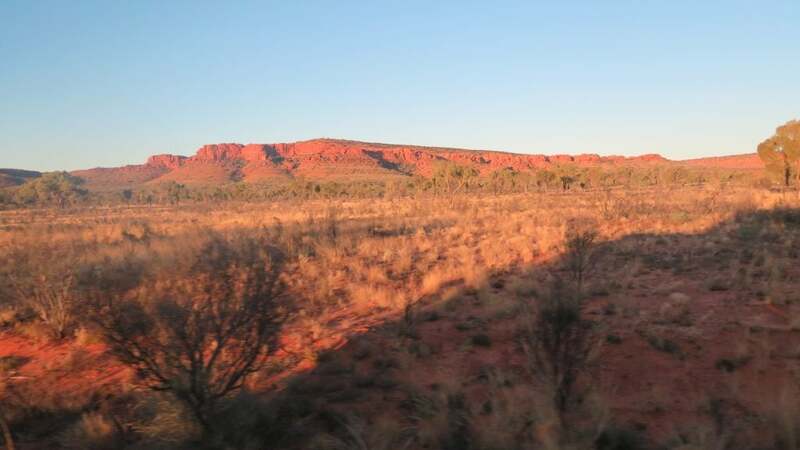 It follows the southern rim of the range from Kings Canyon to Kathleen Springs, and can be walked in either direction. 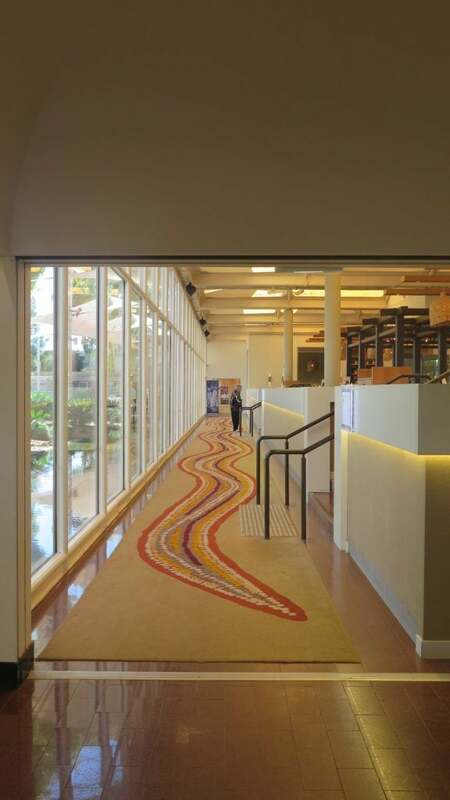 Although Giles found little good country, his expeditions added substantially to the knowledge of central Australia. 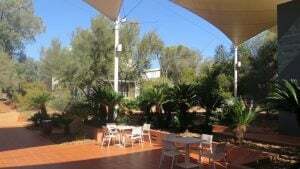 Giles made no major discoveries, but he is among the more interesting Australian explorers by virtue of his journals which, although overwritten, display a fine descriptive ability and constitute a record of inner experience as well as outward observation. His culture, perception and imagination were no less marked than his skill and determination. 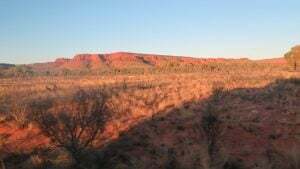 As we neared our destination of Kings Canyon Resort we were travelling alongside the edge of the George Gill Range, and could see Carmichael Crag at the end of the range just as the sun was going down in the west. We settled in to our accommodation and walked the short distance to the lookout to watch the sun setting on Carmichael Crag then headed off for dinner. Kings Canyon Resort is a lovely area, the accommodation units are well spread out – our unit had the usual bathroom, but also a spa bath with a full glass window that overlooked a rocky outcrop (right). As we walked back after dinner, in the silence of the evening, the night sky was aglow with millions of stars, it was a glorious sight and a great way to end a busy and long day. 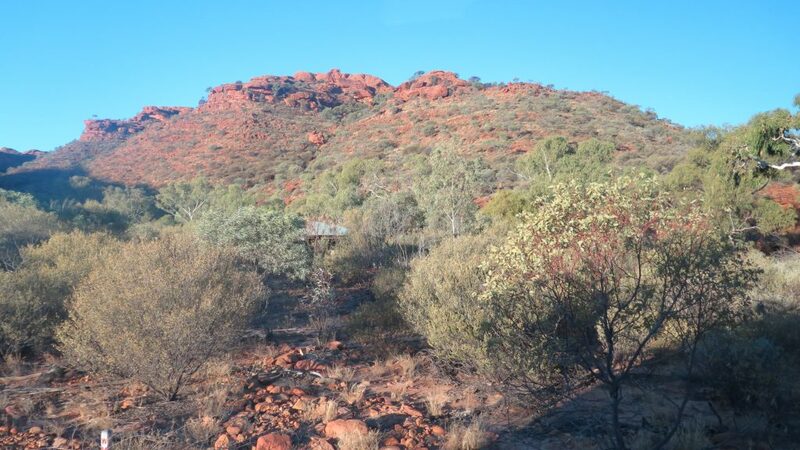 Tomorrow we explore the splendid Kings Canyon.